The HC3 - H is a variant of the HC3 with the topside and the B port closed, not needing a top plate. It is designed for use in NG6 (D03) stacking manifold systems. Like the other HC3 units, the HC3-H is a compact unit. The HC3 has the pilot-operated dump valve incorporated as a standard feature. Maximum outlet pressure is 500 bar in standard versions. Adjustments of the outlet pressure is carried out by varying the supplied pressure. The basic operation is illustrated in the function diagram. The oil is fed through the connecting plate and the filter to the IN port of the HC3 flowing freely through check valves KV1, KV2 and DV to the high- pressure side H.
From the high-pressure side H oil is fed to port A on the connecting plate. In this condition maximum flow through the booster is achieved giving a fast-forward function. When pump pressure is reached on the high-pressure side H, valves KV1, KV2 and DV will close. The end pressure will be achieved by the oscillating pump unit OP. 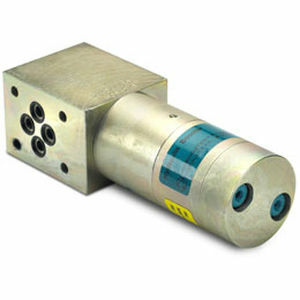 The unit will automatically stall when end pressure on the high-pressure side is reached. If a pressure drop on the high-pressure side exists due to consumption or leakage, the OP valve will automatically operate to maintain the end pressure.